Lowepro is known for their high quality photo bags for professionals and consumers. Lowepro’s bags have always been high quality, but they used to be quite dull and mostly black and very recognizable as a photo bag. 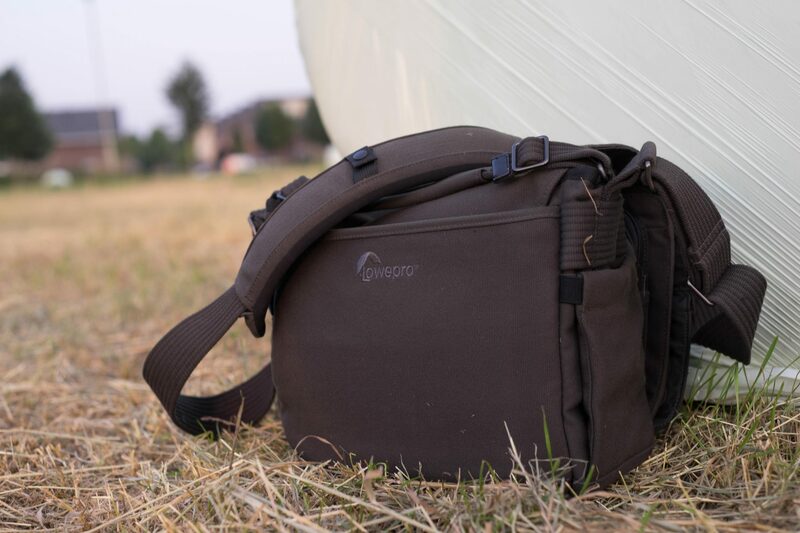 In the last few years Lowepro has shown they also know how to build more casual bags for consumers, like the Lowepro Photo Hatchback I’ve reviewed earlier (click here for the review of the Lowepro Photo Hatchback). With that bag Lowepro has built a bag that looks sharp and sporty, but still has the high quality and smart details we have come to expect from Lowepro. Klik hier om deze review in het Nederlands te lezen op het blog van Degreef & Partner. 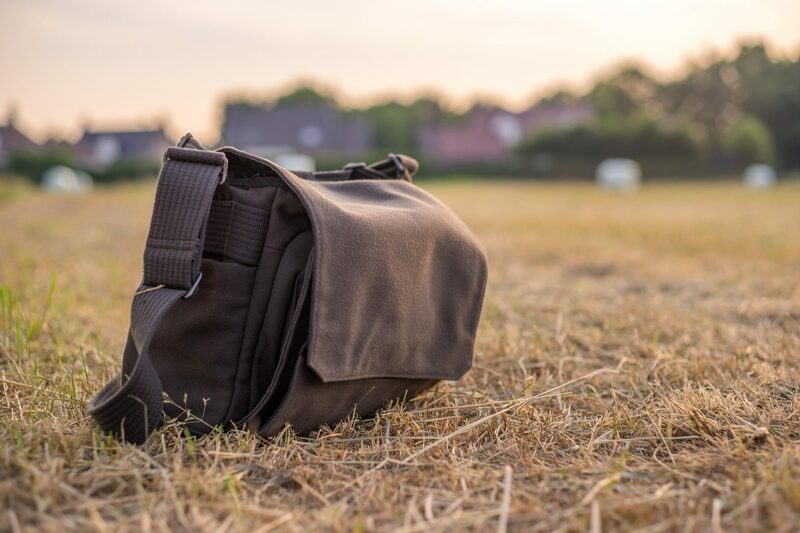 And while the consumer bags have become more fashionable over the last years, The Lowepro Pro bags, designed for professional and enthusiast photographers, were still a little black and dull. 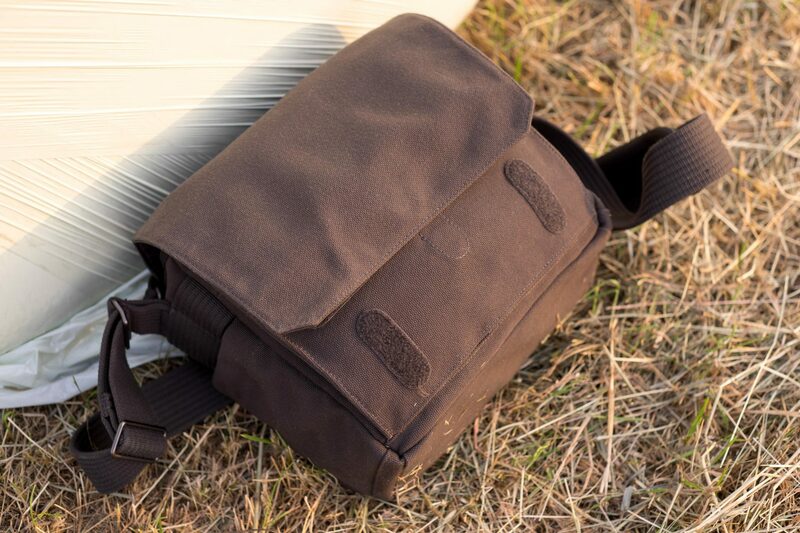 Lowepro seems to have recognized that professionals and enthusiast photographer may also like a more casual looking bag, that doesn’t have to be black per se. For those people they have introduced the Lowepro Pro Messenger bags. The Pro Messenger line consists of Messenger bags that are built for professional and intensive use. There are three models in the Pro Messenger line, the smaller 160 AW, the midsized 180 AW and the large 200 AW. In this review I’ll tell you more about the Pro Messenger 160 AW. The other bags are similar, though they are a little bigger and may have some different details, but all of the Pro Messengers are grey. That may not be to flashy, but is is pretty and doesn’t easily show dirt. The Lowepro Pro Messenger 160 looks very good in its subtle grey colour (Slate Grey). It’s made of a material that looks like canvas, which helps the bag look more unsuspicious. But it isn’t really canvas, it’s a much more durable, water resistant fabric. It’s got the looks, but will protect your gear much better than real canvas would. The look of this material and the subtle colour, combined with the fact there isn’t a Lowepro logo on the front of the bag, means the bag is a very good undercover photo bag. People will hardly notice the bag, and probably won’t see that you are lugging around your expensive gear. That is perfect for situations where you don’t want to stand out in the crowd, for instance if you want to do some street photography or when you are photographing a wedding and don’t want to distract the guests or happy couple. It can also come in handy when you’re visiting areas where you don’t want people to notice you have a lot of expensive gear in your bag. There is another way to stay undetected. There is nothing more annoying than a wedding photographer that has rip open the loud Velcro strips of his bag to switch lenses just before the couple starts with their vows. Or when you a visiting a lovely Mediterranean church and you run out of batteries. So you have to open your loud camera bag with everybody giving you the stink eye because you’ve disturbed them while they were praying. Apparently Lowepro has thought about that also, so they’ve designed a the smart FlexFlap. The FlexFlap normally covers the whole front and is kept closed with two strong Velcro strips. The Velcro is loud enough that you will certainly hear it when someone tries to open your bag secretly. If you need the bag to be silent you just fold the flap, and the Velcro is covered up. In this mode the bag uses small magnets in the flap to keep it closed. These will keep the flap down, but it will open completely silent. This is a great and unique addition to the bag, that I have used a lot during the review period. When you look at the outside of this bag there are two other things that stand out. Both sides of the bag have small pockets to store bottles of water (or sunscreen), or even extra lenses. The pockets may not be padded, but because the material is very thick and tough it will still protect the things you put in these pockets. The pockets have elastic bands in them to make sure your stuff won’t fall out, and make the pockets stretch to accommodate bigger items. On the back of the bag there is a big pocket with zippers on the top and bottom. The zipper on the bottom surprised me a little, because why would you want to have a pocket you can open from the bottom? The answer is both simple as genius. This is a pocket you can convert to a trolley sleeve. Open both zippers and you can attach the bag to a trolly. 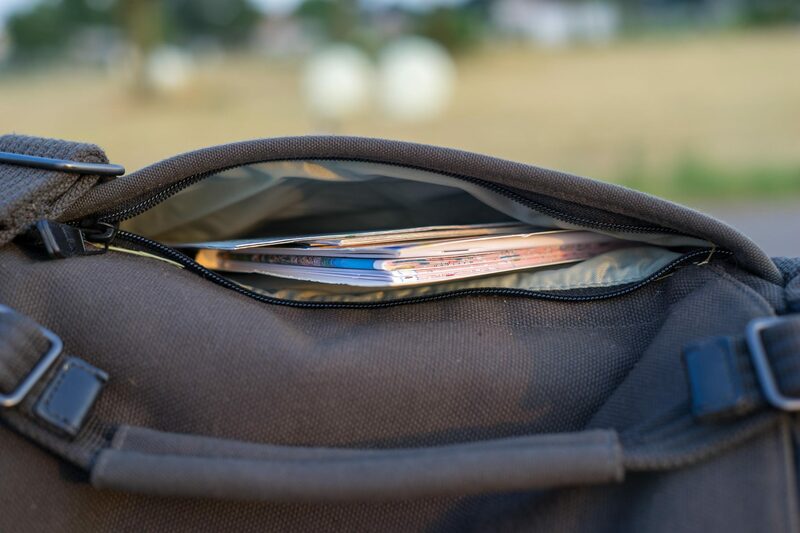 If you don’t need the trolley sleeve you can use it as an extra pocket for small stuff like citymaps or other papers. 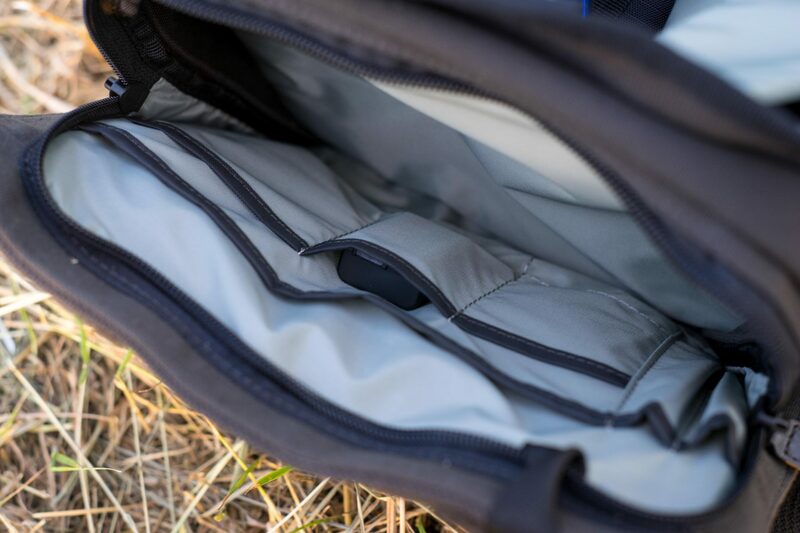 Of course Lowepro only uses high quality zippers, that will last a lifetime. 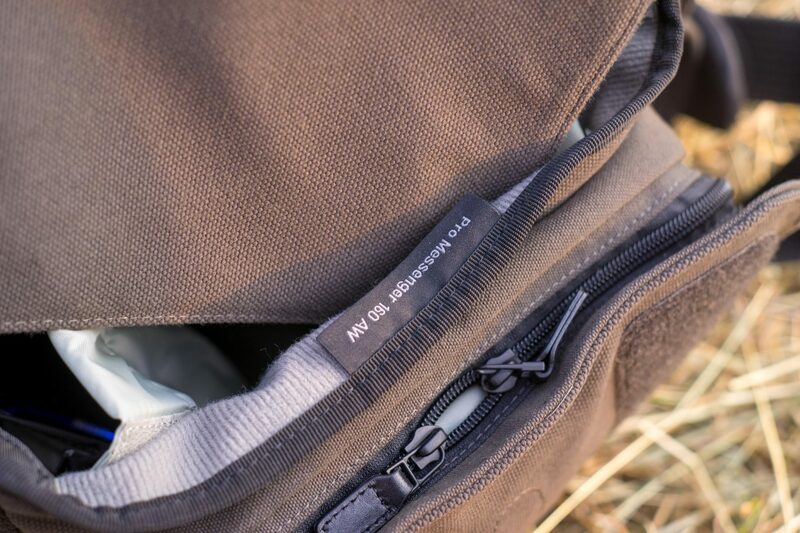 I always love these smart details on the Lowepro bags! This pocket on the back is also the only place on the outside of the bag where you’ll find a Lowpro logo. It’s embroided on in the same colour as the bag, so it doesn’t stand out too much. On top of the bag is a single handle to carry the bag when you don’t want to use the shoulder strap. The shoulder strap is very long and adjustable and has got a big shoulder pad. The shoulder pad is formed ergonomically and has got an anti-slip coating to keep it from sliding from your shoulder. The padding is a little stiff at first, but it will form and get more flexible over the first few weeks of use. On top of the shoulder pad you’ll find a small tab with a press stud you can use to attach optional accessories. It’s also a great place to store your sunglasses when you don’t need them. 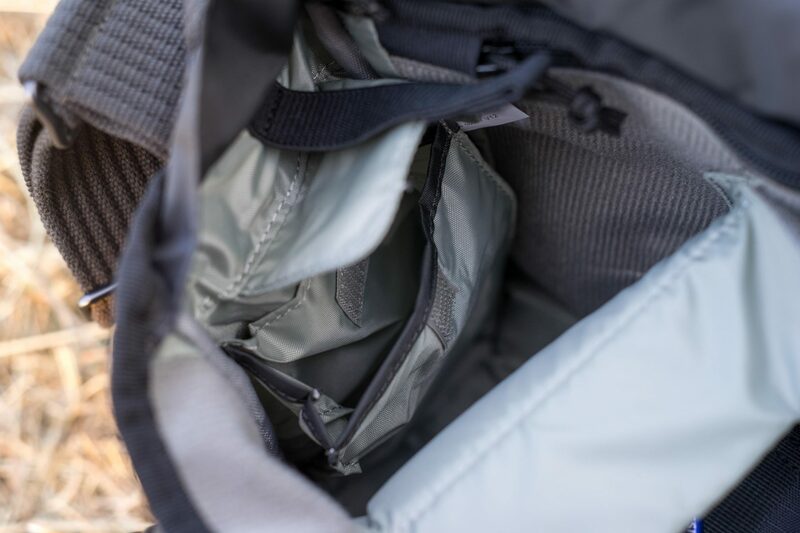 When you open the big flap you’ll find a roomy interior, with a large compartment for your camera and a smaller compartment with a zipper for small stuff. On the inside of the flap you’ll also find a small window you can use to put a label with your name and address. The flap itself has got small pieces of extra fabric on the sides, to keep water or dust from creeping in. The front compartment is quite roomy. It has slots for small stuff, like batteries, SD-cards or filters. The sides of the compartment have extra room to stretch if you overload it. Under the front compartment you’ll also find the All Weather cover. As you would expect from Lowepro the cover is made of a thin, water resistant material in a light grey colour with a subtle Lowepro logo. Because of the light colour the AW cover will also protect your gear from the bright sun and heat. The raincover has got a press stud to secure it to the bag. 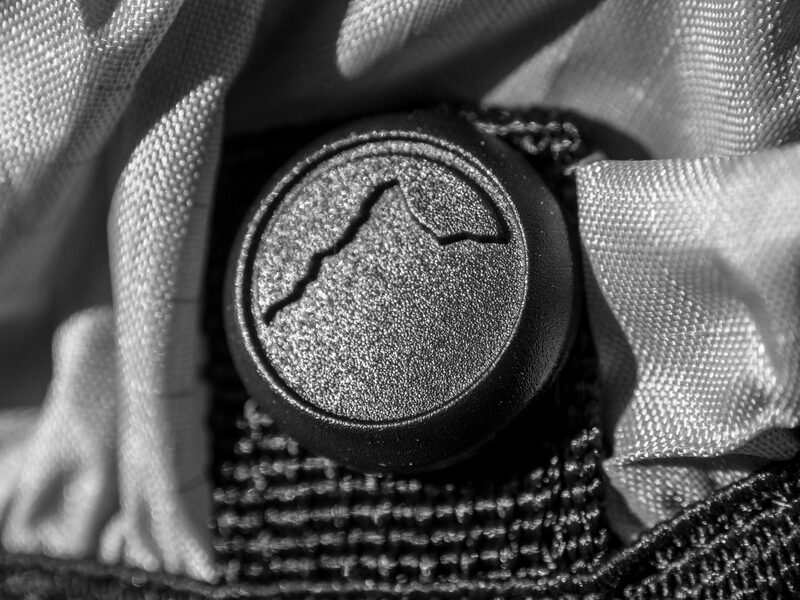 Lowepro hasn’t forgotten about the details, the press stud on the cover has got the lowpro logo embossed on it. Looks great! The bag is quite resistant to rain by itself, so you’ll only need the AW in really heavy rain or snow. The main compartment is big, and has got enough room for a big, pro-style DSLR camera with a f2.8 midrange zoom lens. It will also store two extra lenses or other gear like a speed light. The dividers Lowepro supplies with the bag are softer then you normally find in a photo bag. This means they can adjust to your gear more easily, but because of the thick padding they will protect your gear just as good. In the main compartment you’ll find an extra compartment with a zipper to store valuables like your wallet or smartphone. On both sides of the main compartment there are small pockets, with a flap and in those pockets you’ll find another small pocket. It’s like Lowepro’s own version of the Russian (Matryoshka) dolls, open one up and you’ll find a smaller one inside. The pockets are big enough to store a smaller lens like my SMC Pentax M 50mm manual lens. With a Lowepro bag you can expect the quality to be top notch. But the Pro messenger surprises in a positive way. The bag is simply high end. It’s made of high quality materials that will last a lifetime, even with intensive and professional use. With a weight of about 1.4 kilogrammes the bag isn’t really heavy, but is does feel sturdy. Most of the weight is caused by the thick fabric the bag is made of. The construction of the bag is very impressive. On strategic points you’ll find extra stitching to keep it from ripping, even under heavy loads. While the bag isn’t cheap by any standard it will last. I doubt an amateur photographer would even be able to wear this bag out at all with normal use. In day to day use this is a great bag. The shoulder pad has got thick padding that helps to distribute the weight, even when you have heavy pro-style gear in it. The smart flap with the silent opening option is fantastic, I’ve used it a lot during my last vacation. Combine that with the subtle but modern look, and you have a camera bag you can take just about everywhere. It will complement your look when you’re in shorts and sandals during you vacation, but it won’t look out of place at a wedding. Because of all the small pockets and zippered compartments you can stow a lot of small stuff in it. But it may sometimes take you some extra time to remember where you put your stuff. The Lowepro Pro Messenger costs 209 euro’s in the Netherlands. While that is a lot of money, this is a bag that will last for years, even when you lug it around daily with a lot of heavy gear in it.